If you are Bridemalta.com visitor, we recommend the featured vendors above. If you would like to be given contact details of a particular vendor, click here to tell us. We will contact the vendor to see if he/she is interested in featuring his/her service here! 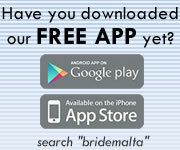 If you are a wedding vendor, click here to feature your service above and provide contact details to Bridemalta.com visitors!